Take a pinball machine, turn it vertical, remove the element of player skill, throw in lots more balls and some loopholes in Japanese gambling laws, and you've got pachinko. Balls fire into the playfield of the machine, where they fall unpredictably through a maze of pins. If balls fall into special areas you get more balls, or other benefits like a spin on a built-in slot machine that disgorges still more balls on a jackpot. Simple enough in concept, though modern pachinko machines are often extremely elaborate in presentation. It's very popular in Japan, and spawned several videogame adaptations for the Famicom. There was a problem, though: The control mechanism for pachinko, a knob which the player turns to control the amount of force with which balls are launched, doesn't translate to a Famicom gamepad very well. 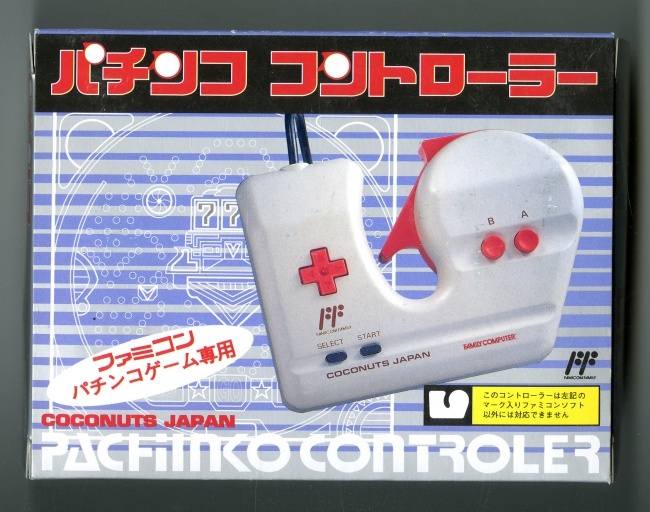 Enter the Pachinko Controller from Coconuts Japan. It's an oddly-shaped Famicom gamepad with a large gap between the D-pad and the A and B buttons to provide room for the controller's central feature, an analog knob mimicking the controls of a real pachinko machine. Several Famicom pachinko games were compatible with it, providing a finer degree of control and a more authentic pachinko experience. You still had to provide the miasma of cigarette smoke and looming presence of organized crime yourself, though. Despite the popularity of pachinko in Japan, it's an odd choice of games to build a Famicom controller around. First, pachinko is a game of chance that involves little to no skill or strategy on the part of the player; a wad of gum to hold the knob in place can play it at least as well as most humans. The Famicom couldn't come even remotely close to replicating the audio and visual elements that make real pachinko machines entertaining despite their dearth of actual gameplay, so there's very little in pachinko to build a videogame around. Second, it's odd because of what real-life pachinko actually derives its tremendous popularity from: Gambling. Casino gambling is illegal in Japan, technically. Officially. Sort of. Instead, when you go to your local pachinko parlor, you pay for a quantity of balls to play in the machines, which reward winners with more balls. You can use those balls to continue playing even more, or exchange them for "prizes." These prizes tend to be really lame - except that, in a truly remarkable coincidence, there is always a store in close proximity whose proprietor is inexplicably eager to pay substantial sums of money for these worthless geegaws. And so, in the eyes of the law, what goes on inside a pachinko parlor is Not Gambling. Except it blatantly is, and not even the sort of gambling that you can be better or worse at like poker or mahjong or cockfighting. Even if it hadn't been regarded as a children's toy at the time - which, of course, it was - the Famicom obviously couldn't replicate the gambling aspect, which meant most of the point was gone. So the Pachinko Controller is basically the Japanese equivalent of an American NES controller built around a slot machine arm. You know, for kids.